I came back from Australia in late January 1975; the Australian experience had lived up to all my expectations. I went over there as a young 18 year old lad, still wet behind the ears, and it turned out to be an incredibly valuable three months of learning about racing, preparing machines and life. When you are part of a touring team you see how other people set up their equipment and you learn new ideas. After all, at 18, you really know bugger all in the great scheme of things. That type of tour, or any experience that makes you look closely at yourself over a few months, does help you to grow up. Any self-respecting 18 year old thinks he knows it all; well the Aussie trip checked that pretence! I knew I had learned a bit more about many things, but most importantly I knew I had a lot more to learn. Therefore, I was keen to get on with the new UK season. My equipment for the new season had not yet been finalised, I had completed all my 1974 racing on the short stroke JAP's. Although they had given me some credible success, their reliability was in question. I was getting advised by a number of people to move over to Jawas. I had competed in Australia on a Jawa and I was starting to think this way myself, but Jim Rawlinson still had great enthusiasm for the JAP. I was willing to start the season with them and see if their reliability had been improved. However a rather heart-rending set of occurrences decided the way I should go. While I had been away in Australia, Jim had a technical idea he wanted to try out. He acquired a blank cylinder head casting for a short stroke JAP in order to create a special cylinder head with the valve angle in a more upright position. The engineering work on this head also had innovative ideas applied to it: most engines are production models that only allow you to modify what has already been done, but this was a blank canvas and Jim was able to form this cylinder head into something special. While I was increasing my knowledge Down Under, Jim was spending all his available time building this prototype engine that he had high hopes for. On my return to the UK I went along to see Jim and tell him of my experiences over the past few months .During my visit he unveiled his pride and joy: a brand spanking new short stroke JAP with his special priceless cylinder head. It was arranged that I was to give it a run out at the Belle Vue Training School. I was excited about testing this brand new engine with this unique cylinder head and special angled valves. It also had an improved con rod to overcome the devastation caused by them breaking - weak con rods were the JAP's Achilles heel. It felt good as I warmed the machine up in the pits, and I was told to take it easy for a few laps. I managed to avoid the temptation of seeing what it could do during its first run and did what I was told: 'take it easy, just run the engine in.' It felt great - definitely something special. Next time out I would put it through its paces; and that was what I did. I was part way through the second four lap test when it happened. For anyone with an ear for a sweet sounding engine, the noise that an engine makes when the con rod breaks is like a kick in the head, it sounds and feels really painful. It's like a sound effect from a science fiction movie, metal against metal, steel on steel, it's an engineers' and mechanics' nightmare. When a con rod breaks the flywheels are doing about eight thousand revs per minute, generating about 45 plus break horse power. The con rod that connects the piston to the flywheels, while they are happily joined together, the flywheels go round and the piston goes up and down in the barrel and the valves on the cylinder head all work how they should.then BANG! The con rod breaks, usually near the top where the piston joins it - the weakest point - in an absolute split second the piston with nothing to stop it goes straight up the barrel and smashes into the top of the cylinder head while the con rod now without the piston to guide it and 45 plus BHP of energy to show off wants to get out - and it usually does! I was horrified when it blew; it was brand new I could not believe it. I had a sickening feeling in my belly, that was about to get worse. I knew straight away it was the con rod failing again - so much for the new improved type. As I surveyed the damage the devastation was predictable, the con rod had smashed through the front of the barrel smashed the front crank cases then carried on round smashing the back of the crank cases and buried itself in the magneto at the back of the engine. Fairly standard sort of damage, but on further inspection I could see a crack in the cylinder head - the special unique cylinder head. The force of the piston had split the cylinder head right through the inlet and exhaust port. It had taken Jim months to engineer this special head and in split second all his hard work was in ruins. When I took the engine back, Jim was his usual philosophical self, a kind of 'Oh! Another one gone,' until I pointed out the damage to the cylinder head, then the blood drained from his face. His disappointment was clearly evident and I had never seen him so deflated. That was really the end of the Short Stroke JAP, that con rod breaking caused far more damage than wrecking one engine. Not long after that, the JAP was out of production and I rode a Jawa during the 1975 British season. As I embarked on a new season I felt that my experienced gained in Australia had boosted my progress in becoming a more complete International Speedway Rider. My target as a club rider was to achieve an average of over nine points per meeting, which was likely to put me in the top 10-15 British League Riders in the country -which at that time really put you in the top 20 riders in the world. Qualifying for the World Speedway Final at Wembley was also a target, but to be fair I realised I had a bit more to learn for it to be something I could genuinely influence. Everything that I learnt from my first full season and my trip Down Under I put into practice during '75. Belle Vue had a great team that year, but our local hero Chris Pusey left the Aces and joined the Halifax Flukes, sorry, Dukes. His brother, Geoff, who had doubled-up with the Aces from Stoke, joined us and Russ Hodgson also became a full-time Ace after impressing at Middlesbrough. The departure of Chris 'Polka Dot' Pusey left a bit of a hole in the team and it was clear to most people that the Belle Vue management expected Wilkie, Paul Tyrer and myself to step up to the mark and support PC and Soren. It was time for us young guns to come of age. Racing for Belle Vue was really going well, with the Peter Collins and Chris Morton partnership really starting to develop into something formidable. Team riding on the Hyde Road speedway track provided both Peter and myself with some of the most enjoyable and creative racing throughout both of our careers. It was great fun to do and at the risk of sounding conceited, if it looked half as good as it felt, it must have been a great spectacle to watch. I got off to a good start scoring double figures on a regular basis and in a league match at home to Coventry on June 7, I scored my first full maximum with a 12 pointer as we defeated the Bees, 49-29. I had already scored some paid maximums in 1974, but to go through the card unbeaten really meant that I had, in my eyes, come of age. As it turned out, our next fixture was at Swindon who eventually finished bottom of the table, but we lost 40-38 and I scored 6 points. In the final analysis this surprise defeat probably cost us the championship. Another ambition started to bloom in 1975 when I became a regular in the England side, riding with stars that I used to watch at Belle Vue when I was a kid. Riders like Martin Ashby, Ray Wilson, Terry Betts, Malcolm Simmons, and now friend but childhood hero, Chris Pusey. A test series was arranged with Sweden with five matches in the UK and five matches in Sweden. My Brother Dave was also a regular for England, riding at the time for Hackney, and at one point in 1975 topping the British League averages with an average of over 10 points per meeting. At this point in our careers, Dave had the edge on me, helped by his prolific gating ability, or was it his cheating ability? Probably both. An England team with three rough-arsed lads from Partington still seemed like a dream to us, but it was happening. This series proved to be a bridge too far for the weakening Swedish Speedway nation who did not have the strength in depth that the England side now possessed. England won the series in England 5-0, and also the matches in Sweden 5-0. That aside, the experience for me was invaluable scoring 11 points for England at Belle Vue, and going over to Sweden to ride in three of the matches over there scoring 3 at Kumla, 6 at Stockholm, with my best score being 7 at Eskilstuna. Dave also rode in three meetings in Sweden and was second top scorer to Martin Ashby at Vetlanda. Ashby was by this time an old campaigner, and an obvious choice of captain being the steady, straight-laced chap to keep us young whippersnappers in line. "I witnessed young Chris at Claremont (circa`75) and was suitably impressed, especially after enduring one of Glyn Taylor's explanations, who when passed from view exclaimed 'boy who was that? Ole Mauger??'... priceless. The proof was in the pudding and in the averages, as to who had the right stuff. Good luck with the book Chris, you're always welcome in Aussie, just don`t mention the bloody cricket!!OK?" 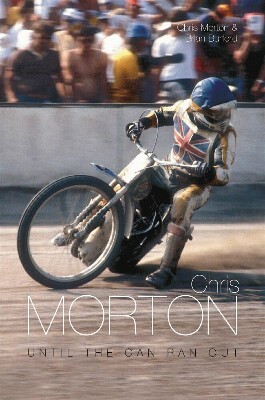 "I bought the Chris Morton book a few weeks ago, on a visit to Belle Vue. It was more than I usually pay for a speedway book, but well worth it. It was a compelling read, having started it, it then became hard to put down, it was so interesting and so honest in the way it was written. A first class read!"